Moore Uni-Drill is a family owned specialised manufacturer of Agricultural and Sportsturf seeding equipment. 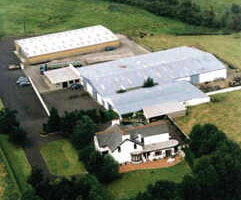 Established in 1973, it began by manufacturing direct drills for the grassland market. In the late 70's early 80's a drill specifically designed for the arable sector was developed and in the mid 80's the specialist sports turf model was introduced. The company operates from Kirk Road, Ballymoney, Co. Antrim, Northern Ireland - 15kms from the legendary Giants Causeway on the beautiful Antrim coast. The surrounding countryside hosts some of the most intensive dairy farming in all of Europe. This is grass growing country, with a unique high rainfall and mild climate, which suits the intensive grassland production which helped launch the original uni-drills. Subsequent development of the original grassland drills into the arable market and, more recently, the sports field market have secured the companies' future. In January 2009, production of the arable unidrills tranferred to Sumo UK at Melbourne in Yorkshire, England. However production continues in Ballymoney of a new range of grassland seeders, as well as sportsturf equipment. We deal in quality used second hand equipment, and represent Horsch and Simba Great Plains equipment in the province of Ulster, and Sumo equipment in the island of Ireland.